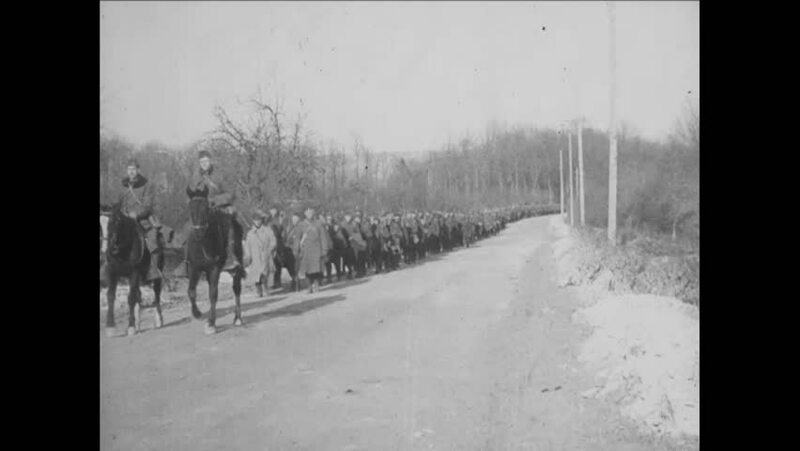 CIRCA 1919 - American infantrymen march from Verdun. hd00:30CIRCA 1918 - American troops march through a French town; a woman doing laundry watches them pass. hd01:04CIRCA 1953 - Soldiers unload supplies and build a lean-to shelter and a campfire and they cook in the snow in a forest in Alaska. hd00:151940s: Car drives snow-lined road up to pay station with Stop sign. View of Grand Canyon. Sign reading "Navajo Rugs Curios. Visitors Welcome. Fred Harvey"
hd01:45CIRCA 1940s - Undercover agent Al walks to a train station through the countryside in enemy territory. 4k00:301930s: Mountain range and wetlands. Young cows grazing as car drives by. Snowy mountains and pine trees. Ocean and pine trees. hd00:191950s: Revolutionary War reenactors. A white flag is waved from the British trenches. American soldiers stand is formation as fife and drum corps with flags and officers on horseback march forward. 4k00:201930s: View of curving country road from driver perspective.